Let's face it college friends, it is hard to stay healthy during the semester. For many reasons. If you are on campus, you find yourself going from class to class with not a lot of time in-between. This only leaves you enough time to swing by the nearest vending machine or coffee kiosk to get something to get your through the next hour and half lecture. Or if you are like me and a majority of your classes are online, you find yourself constantly nibbling on snacks in the house or getting sucked into the work that you forget to keep yourself nourished. 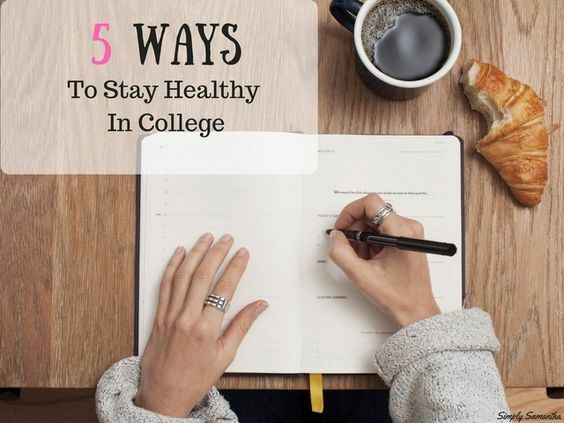 I've been in both situations and I think I have some great tips to help you out as we all get ready to get back into the swing of college, lectures, and class work. 1. Coffee can be your friend AND your foe. I am slowly learning how majorly important protein is! Especially from "non-meat" sources. Protein will help with those afternoon sugar craving attacks. I encourage you to check out Dr. Hymans video with a TON of ideas for great protein filled snacks. Ok this is a biased tip, but I LOVE salads! And I think it's a great daily lunch. I eat a salad every day for lunch, but I mix it up, adding bits of things here and there! Beans, veggies, even lunch meat can help spice up your salad! A salad is easy to pack up a bring with you if you commute to campus (Mason jars are the best for salads on the go). And I know on campus that there is always salad options in the cafeteria. Basically, salads for life! It's SO important to include some type of supplements in your day to day life. It will help your immune system fight off those germs all around your school. I suggest taking a multi-vitamin, echinacea (great immune booster), and calcium. Make sure to stay away from supplements with dyes and unnecessary ingredients! Also they may not be supplements but seriously consider using essential oils! Especially diffusing them! They are so beneficial. Now, for those on campus or those that commute, this is easier said then done. I know when I was commuting to campus I wasn't a big fan of prepping and packing food because it meant walking out to the car and getting a possibly lukewarm snack since the icepack in the cooler I packed it in did NOTHING. But, there are also other ways to prep. Find snacks/food that don't need a cooler or can fit easily in your bag. I kept snack bars or dried fruit in my bag when I was on campus. Now at home, I keep pre-cut fruit and veggies in easy reach and LARA bars in my purse/backpack at all times. If you have the time, think ahead and prep! Do you have any tips?? I'd love to hear them!